Journey through history, one event at a time. 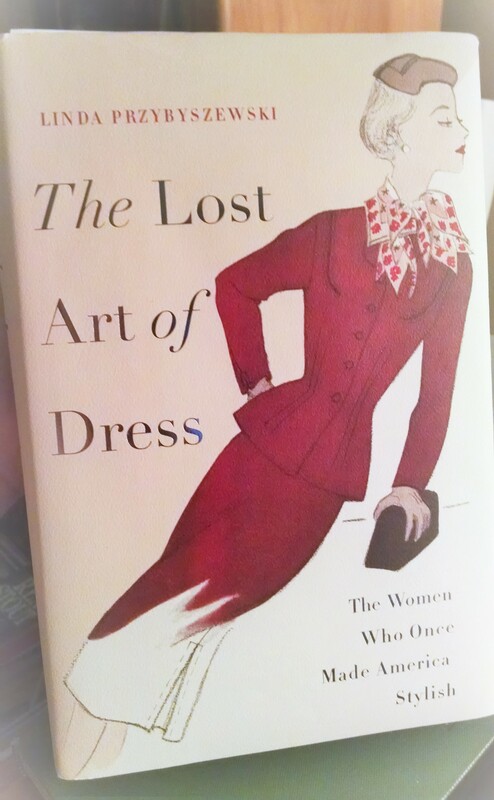 AS I BEGIN, let me say “thank you” to Linda Przybyszewski, the author of The Lost Art of Dress: The Women Who Once Made America Stylish for this splendid, well-written, thoughtful, humorous, opinionated, and important book. Splendid because it covers a topic I have sorely missed reading about outside my own collection of fashion and dress planning books from the first half of the 20th century – that is, common sense, modesty, and good taste in dress. As an art history student, I was excited to read about how the “Dress Doctors” – professors, designers, lecturers, and authors, mainly female, of the Home Economist movement – applied the principles (harmony, rhythm, balance, proportion, and emphasis) of what makes “art” beautiful to the composition of dress. The beautifully accessorized outfits of the 30’s and 40’s, the hats, the gloves, the varied and unique dress colors. One look around at what the stores offer this Summer and I bury my head right back in The Lost Art of Dress. What’s happened to the expression, creativity, individuality and chic that was possible in the fashions of half a century ago? According to the author, the 1960’s happened along with the feminist backlash to the Home Economist movement, which they decided stereotyped women. To add to the trouble the space race drew funding away from what was considered “non-essential” – the home, nutrition, parenting, beauty decor and dress, sanitation, food preservation and consumer standards and toward nuclear weapons and war – quite a trade-off. The 60’s ushered in a rejection of art in dress for a sort of anti-harmonious cacophony of “expression.” Clothing lost the fine dressmaker details of the previous decades and one and all, young or old was expected to aspire to the same “youth obsessed” style. WHAT I PARTICULARLY like about this book is the author’s willingness to be frank about what she thinks. So many social history topics are ruined by an author’s attempts to please everyone at once – even polar-opposite opinions! Professor Pski…, as she is known on her website….., teaches at the University of Notre Dame and states her case with verve, good taste, and humor. Along the way, as she delineates how the art principles of design apply to dress, she also informs us of an important piece of 20th century social history – the rise and fall of the Home Economist movement and the USDA. If your taste in clothing runs to garish, grunge, or short and tight you will probably disagree with the author, but you may nonetheless enjoy the history she offers. The Home Economist movement, USDA, and 4-H programs brought “home-making” skills to millions of women, and it also provided the skill of dressmaking to thousands of women. This practical education became a means of making a respectable living, especially during the “make-do” era of the Great Depression. My grandmother was a product of this system and I can only begin to scratch the surface of the skills she had. Women have many education opportunities now, but it’s vital not to demean the education and wisdom of women in this past era – they were able to absorb a vital core of skills that no college or university offers now. We are clueless in their presence in many ways. Another detail I appreciate about the book is the perhaps blunt, but common sense explanations the author offers for modesty. There is a spiritual element to modesty and most who feel the subject is important approach it from this perspective, but Pski offers an undervalued, but pragmatic explanation of why mini-dresses, sheers, tight clothes and exposed flesh are not particularly tasteful, and are extremely impractical. How does one maintains one’s dignity in a mini-dress, seriously? Thank you for explaining why modesty and good taste and style are not opposites, but all elements of a harmonious whole!! SO PLEASE READ this book for many reasons, none the least of which, is that it is an extremely well written, fascinating, well documented example of historiography. It is a form to which good historians aspire. Read it also if you are one of the many in our generations X, Bridge (of which I am one), or Millennial who love the styles, ensembles, and outfits of the 30’s, 40’s, 50’s and wonder what principles of art and science made those styles so lovely. On a pragmatic note, with the concepts outlined in The Lost Art of Dress it is still possible to aspire to the good taste of those eras. Finally, read it because the skillful and talented women who were products of the Home Economist movement (our grand and great-grand mothers) deserve a tribute to the abilities and skills they acquired and the contribution to society they made. Their resourcefulness and determination raised families, helped win wars, and achieved greatness in various professions.